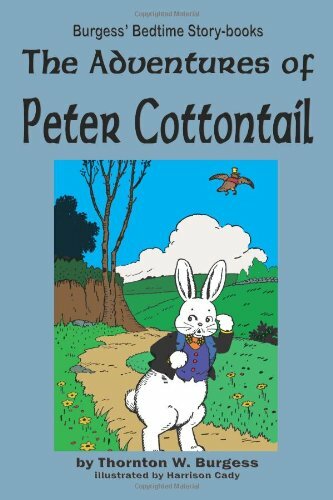 The adventures of Peter Cottontail. 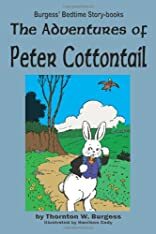 Originally published in 1914, "The Adventures of Peter Cottontail" is part of the rich heritage of children's nature books left to us by Thornton W. Burgess in his long running - and much beloved - series of children's nature books about the Green Meadow and the Green Forest. * * * * Children will love hearing, and reading, about Peter Cottontail and his adventures in the Green Meadow and Green Forest when he tries to change his name, when Reddy Fox invites him to breakfast, when Shadow the Weasel invades the Briar-patch, and what happens when first Johnny Chuck, then Old Grandfather Frog, and then even Ol' Mistah Buzzard, say they will see Peter in the Spring, but it is not yet winter! * * * * Young readers travel to the timeless world of the Green Forest and Smiling Pool. Gentle lessons about nature, the environment, and the "lesser folk of fur and feathers" for today's young readers and listeners. * * * * Any imaginative child will be captivated by this book. The chapters are short, with simple language that children will identify with, and is printed in easy-to-read 14-point type. Read aloud to pre-readers, or read by children themselves, this book will surely be a family favorite in no time. This edition includes the original six Harrison Cady illustrations. * * * * "The Adventures of Peter Cottontail" is the third in Thornton Burgess's "Bed-Time Storybook" series and is also included with "The Adventures of Reddy Fox," "The Adventures of Johnny Chuck," and "The Adventures of Unc' Billy Possum" in Flying Chipmunk Publishing's "Thornton Burgess's Bed-Time Storybooks, Volume 1." * * * * Check out our other Thornton Burgess books at www.FlyingChipmunkPublishing.com (And download the FREE 20 page "Mother West Wind/Peter Rabbit Coloring Book" available there! ), or Friend us on Facebook for our latest Children's, Juvenile, and Adult releases.